What an honor for LoMo to be our first Athlete of the Week. Kid is only 23 years old and we just recently started following him on Twitter. (@LoMoMarlins) Dude is funny. Very funny. Who is he? 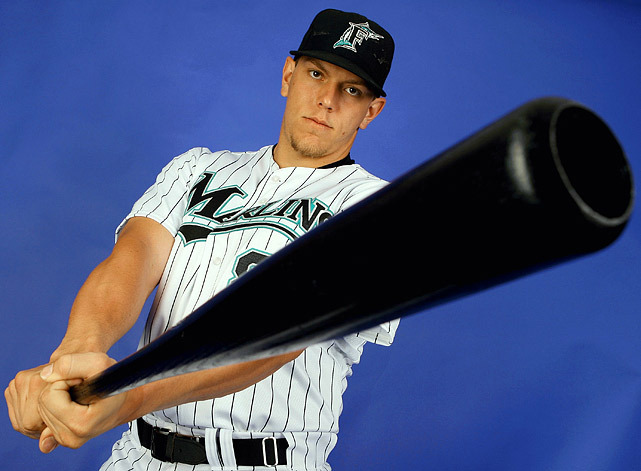 He’s a summer 2010 call up for the Florida Marlins and got his first major league hit that same day. Looks like he’s going to be a legit prospect for the Marlins. Will be interesting to see what he can do in 2011. Regardless of what happens, he’ll handle it like a stallion. Check this…back in September, LoMo was in the on-deck circle, when mid-warm up swing, Emilio Bonifacio laced a late-swing foul ball right into LoMo’s face. 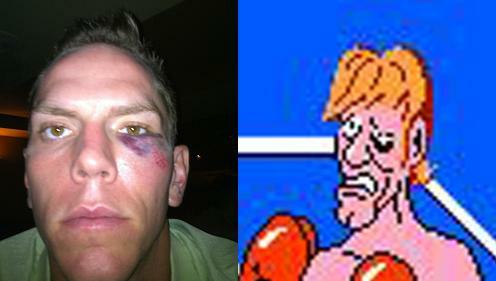 (“But what if he shot you in the face?” “What if they shot me in the face?” “That’s a risk we were willing to take.”) He ended up walking away on his own will, but afterward, he sure looked like Glass Joe after a few rounds with Kid Dynamite. However, our favorite thing about LoMo? His tweets. One of his 10,000+ followers asked him, “what’s your main focus this spring?” I was expected a technical answer… my swing, my focus, my stance, my fielding…something. How’d he respond? “Wake up and be on time.” Ha! That was my goal everyday when I was 8 years old. Love it. Another follower states, “Ben and Jerry’s Half Baked ice cream might be the greatest thing ever.” His response? “Is that the Tim Lincecum flavor?” Yes! Game, set, match, LoMo. The Freak and Dave Chappelle alike are both shakin’ their heads thinking, “that was spot on”. Yesterday, we tweeted that LoMo was becoming our favorite new follow…his well thought out response? “Booyah!” That was it. Booyah, indeed LoMo, keep up the good work. This entry was posted in MLB and tagged Glass Joe, Kid Dynamite, Logan Morrison, Marlins, Mike Tyson, MLB, twitter. Bookmark the permalink.